My little farm girl found a mink this morning… a live one in our chicken coop. The kiddos milked our dry goat, we got 1 pint! My experience with a sudden lump on my dairy goat- It’s NOT Caseous Lymphadenitis (CL)! Caseous Lymphadenitis (CL) is a chronic contagious disease affecting mainly sheep and goats This disease is also called pseudotuberculosis or often “abscesses,” and has been referred to as the curse of the goat industry throughout the world. 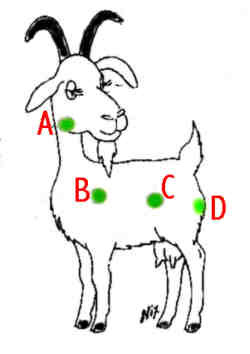 The locations shown in the photo are where CL lumps typically appear. Mom, it’s like a zoo around here! St. Francis of Assisi at work? Cat piss has fried my brain and I can't come up with a title for this crappy post. Really, 5 min cake in a mug? You becha! Pets are adjusted, I think. Hell has frozen over! Don't worry, I am not dead- just blog slacking.